Mrs. Marcella Lewis is an outstanding woman and a legendary figure among Garinagu throughout Belize. She has made an immense contribution to the cultural and literary development of Garinagu and Belize. 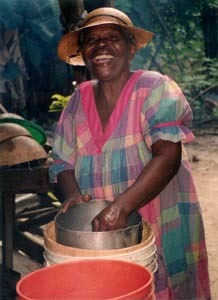 In October of 1981, she was a pioneer in the formation of the National Garifuna Council. 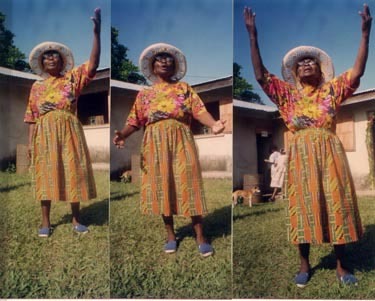 Auntie Madé, as we affectionately call her, is a mother, grandmother, wife, farmer, poet, actress, and choreographer. Since 1972, she has been actively engaged in the preparation and training of candidates for the Miss Garifuna Belize National Contest. Under her excellent training, many beautiful young ladies from Hopkins Village have won that contest. 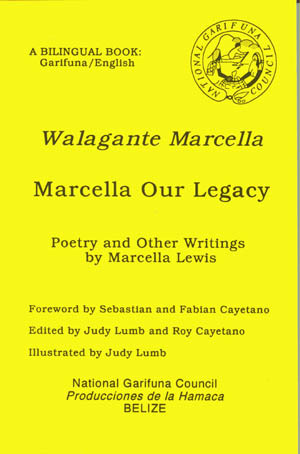 All her life Auntie Madé has been writing poems and prayers and recording them in her book in Garifuna and in English. In all her writing she insists that it be written in both languages. As a practising linguist, she is also concerned about the standardization of Garifuna orthography. For her contribution to the promotion, preservation and retrieval of Garifuna culture, tradition, music and dances, Mrs. Marcella Lewis was recently awarded a Citation by the National Garifuna Council. A few of her poems were published in 1977 in a Garifuna anthology entitled Chülüha Dan (It's About Time). Auntie Madé has travelled and visited several countries including Guatemala, Honduras, Saint Vincent, United States of America, and Canada. She is a cultural ambassador for Belize, promoting her culture wherever she goes. She is indeed a Belizean patriot. A few years ago, Mrs. Lewis was honoured by the United Garifuna Association of New York. For the past two years, Auntie Madé has given much of her time to the production of the People's Garifuna Dictionary. Mrs. Marcella Lewis is a commisioned Lay Minister and actively involved in the evangelization of Hopkins. She is a very spiritual person and this spirituality manifests itself in great inspiring poems like Béibuga Luma Inarüni (Walk With Truth).